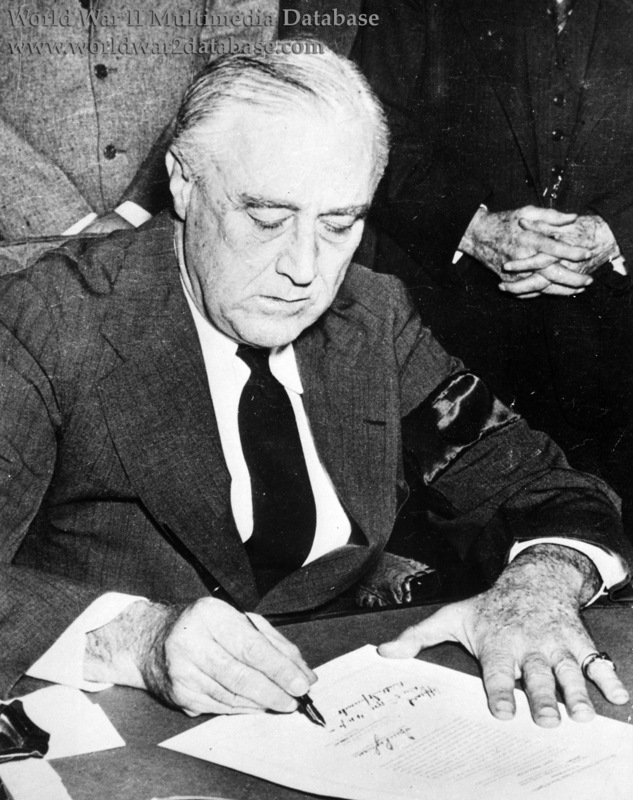 United States President Franklin D. Roosevelt (January 30, 1882 - April 12, 1945) signs House Joint Resolution 254, the declaration of war against Japan at 1610 Hours in the Oval Office of the White House. He wears a black armband to commemorate the death of his mother, Sara Roosevelt Sara Ann Delano Roosevelt (September 21, 1854 - September 7, 1941). After speaking to a joint session of Congress at 1230 Hours, the Senate voted 82-0 in favor of war, and the House voted 388-1, the lone dissenting vote from Representative Jeannette P. Rankin (June 11, 1880 - May 18, 1973), Republican from Montana, a committed pacifist who also voted against American entry into World War I. She said during the short House debate, "As a woman, I can't go to war and I refuse to send anyone else." The bill passed at 1310 Hours; some national debate followed in the press as to whether the war was declared from the moment it passed Congress or from when the President signed it. This was, of course, a moot point since Japanese forces were advancing everywhere from December 7. Attending the low-key ceremony at the Oval Office were Vice-President Henry A. Wallace (October 7, 1888 - November 18, 1965); Senators Alben W. Barkley (November 24, 1877 - April 30, 1956), Democrat from Kentucky; Warren R. Austin (November 12, 1877 - December 25, 1962), Republican from Vermont; Charles L. McNary (June 12, 1874 - February 25, 1944), Republican from Oregon; Thomas T. Connally (August 19, 1877 - October 28, 1963), Democrat from Texas; Carter Glass (January 4, 1858 - May 28, 1946), Democrat from Virginia; Speaker of the House Samuel T. Rayburn (January 6, 1882 - November 16, 1961), Democrat from Texas; Representatives John W. McCormack (December 21, 1891 - November 22, 1980) Democrat from Massachusetts; Joseph W. Martin, Jr. (November 3, 1884 - March 6, 1968), Republican from Massachusetts; Luther A. Johnson (October 29, 1875 - June 6, 1965), Democrat from Texas. After signing, Roosevelt put his feet up on his desk in a relaxed posture, and chatted with the assembled politicians.